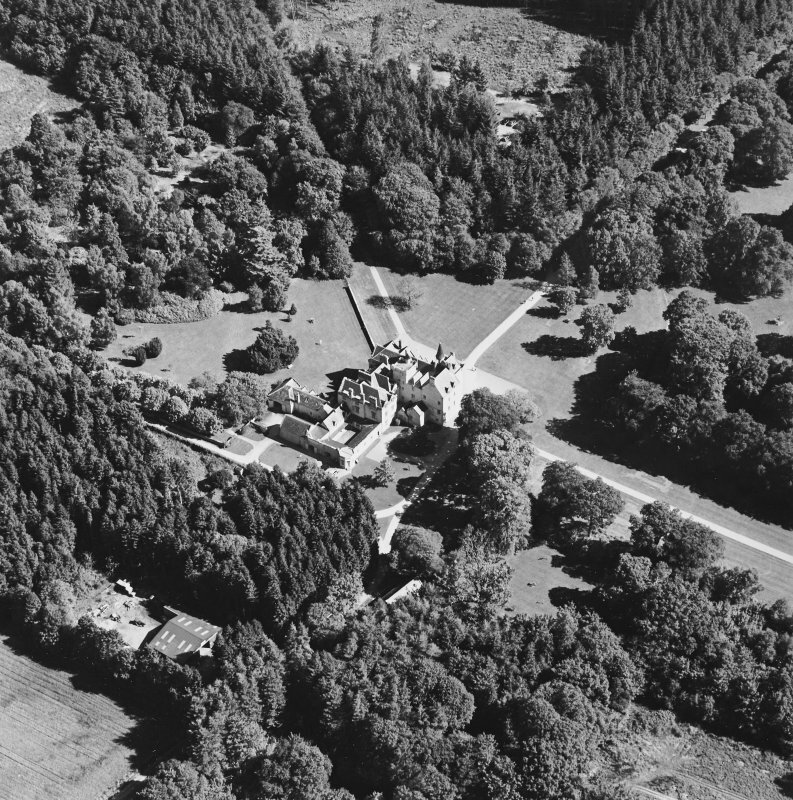 Oblique aerial view centred on the country house, taken from the WNW. 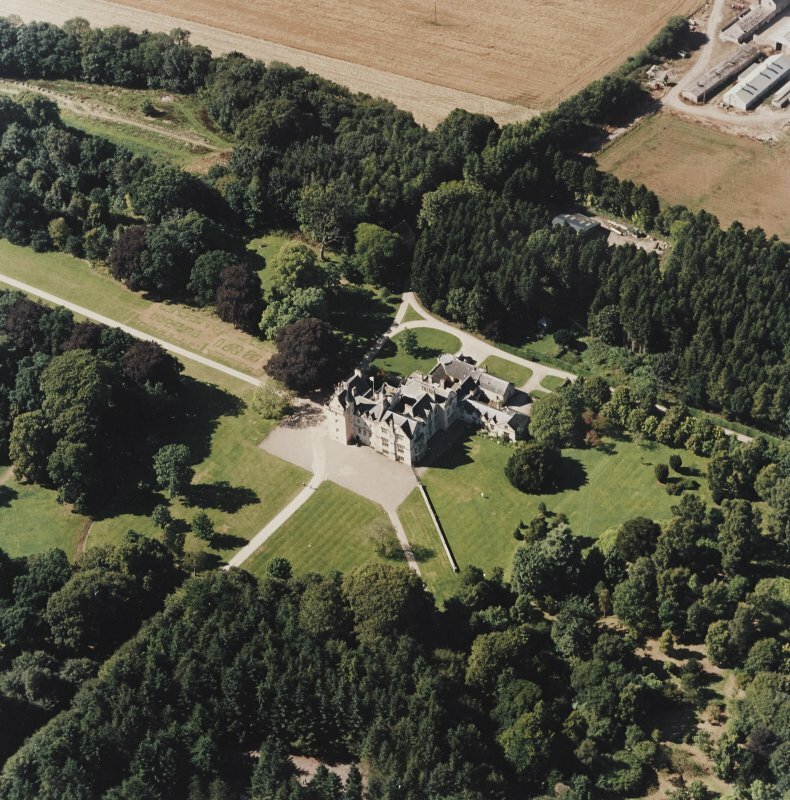 Oblique aerial view of Brodies Castle and gardens, looking NW. 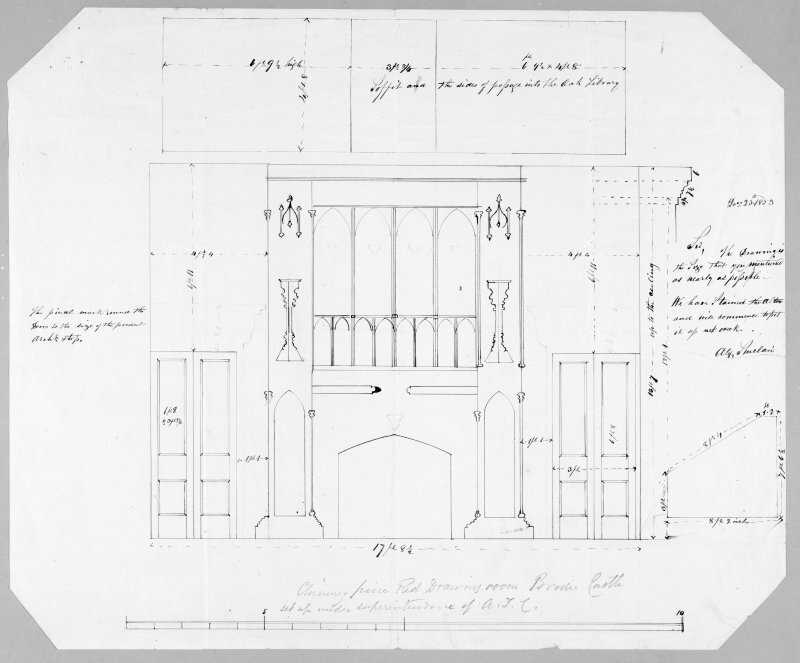 Photographic copy showing design of chimney piece for Red drawing room by A T Clarke. 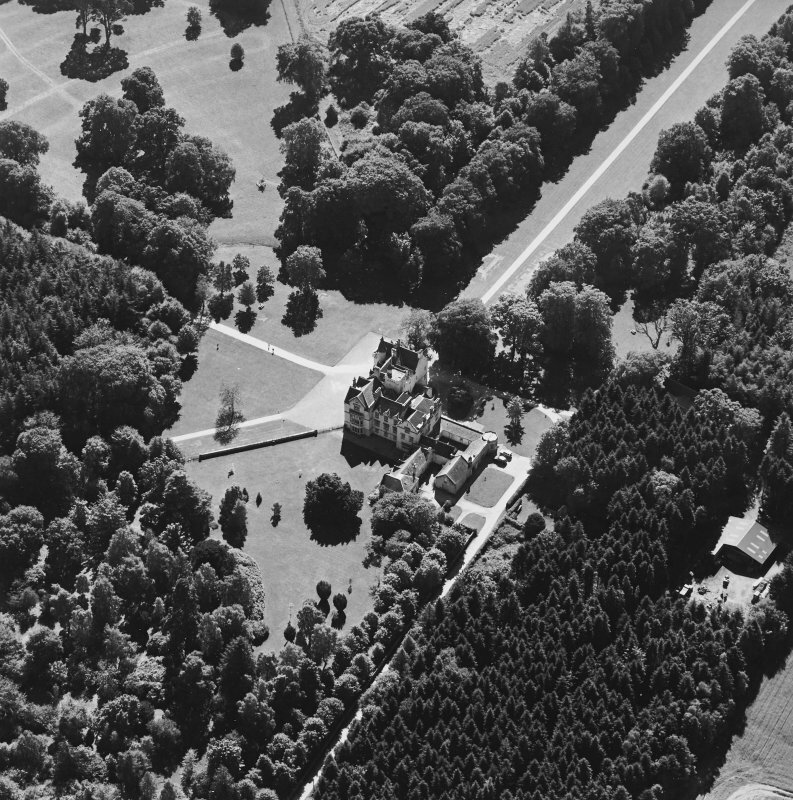 Oblique aerial view centred on the country house, taken from the ESE. 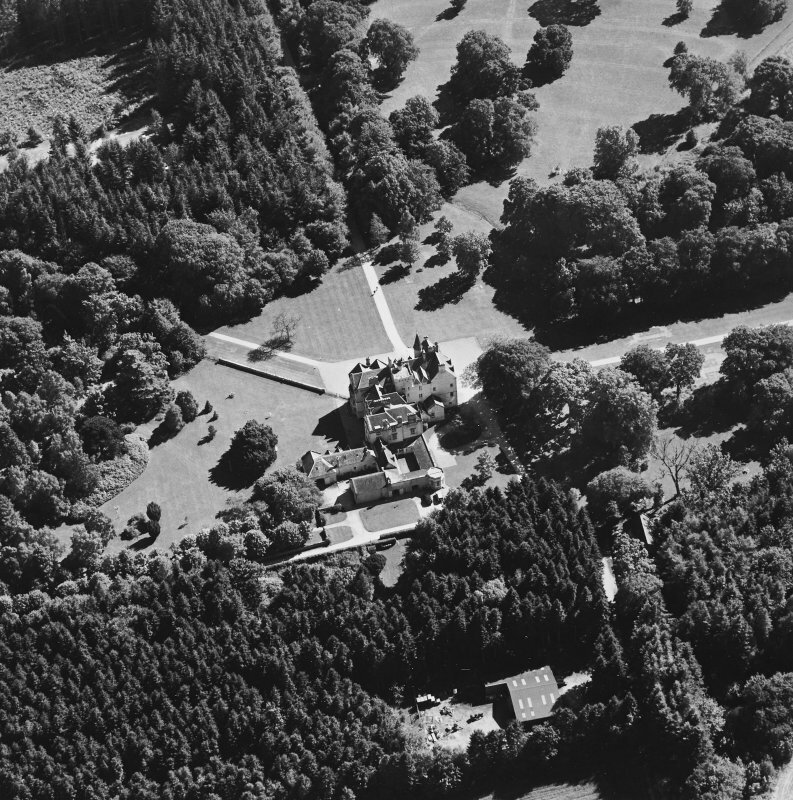 Oblique aerial view centred on the country house, taken from the SSW. 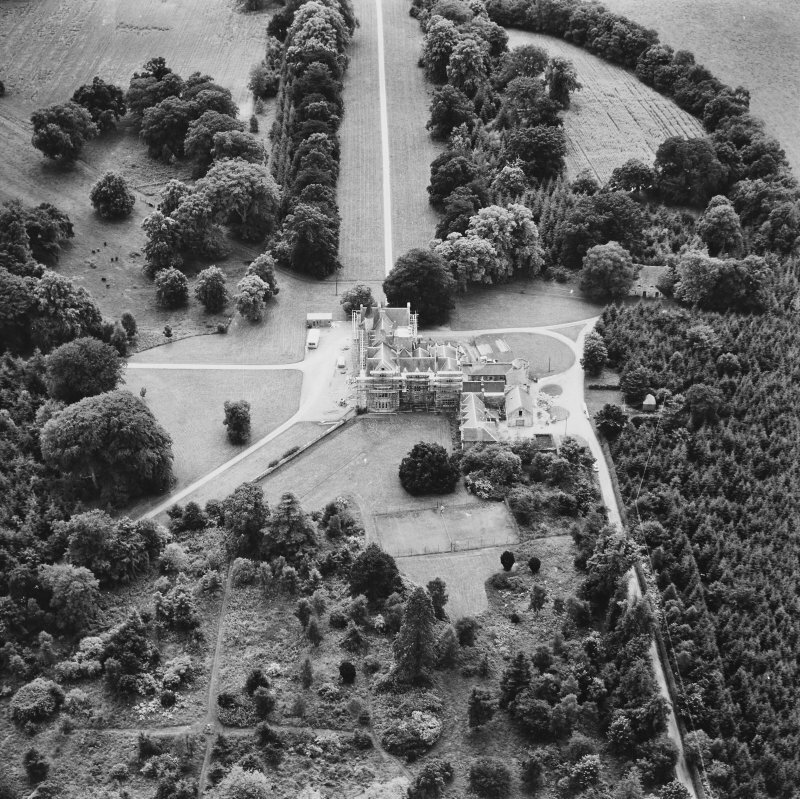 Oblique aerial view centred on the country house, taken from the SE. 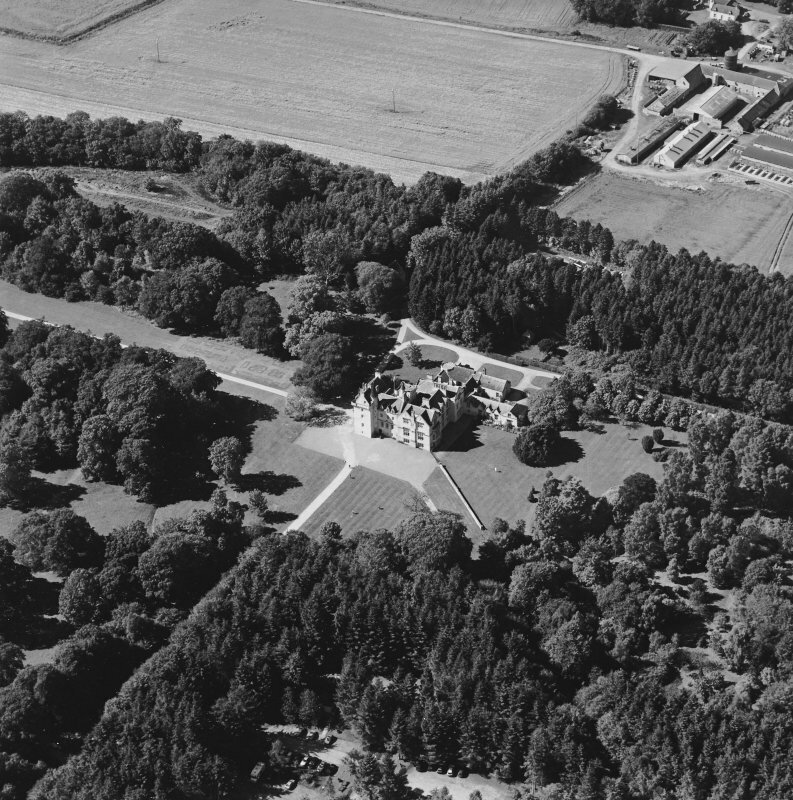 Oblique aerial view centred on the castle, country house and walled garden with the sawmill adjacent, taken from the SE. 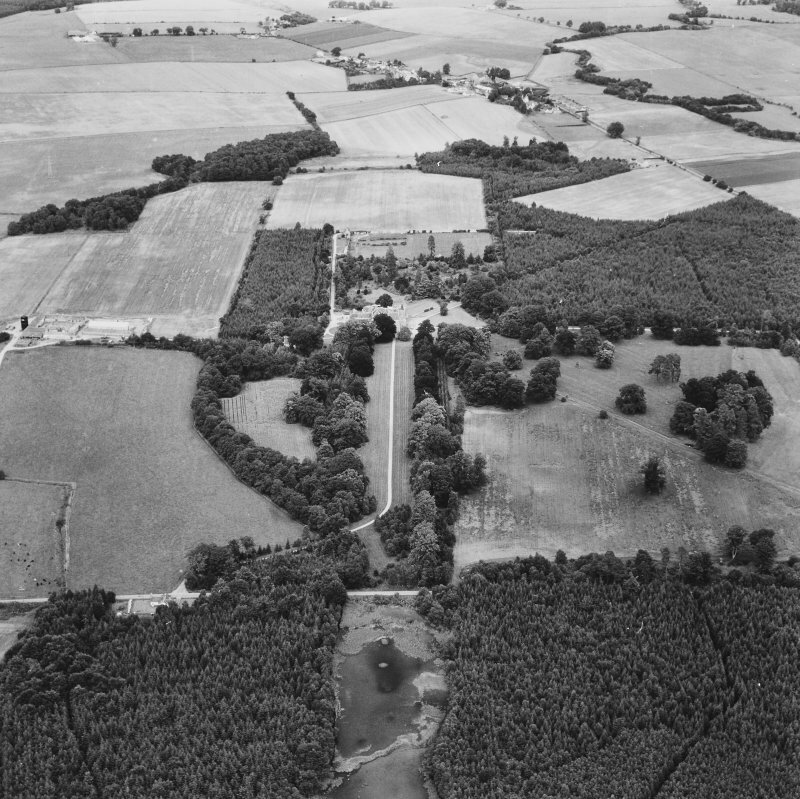 Oblique aerial view centred on the country house, taken from the ENE. 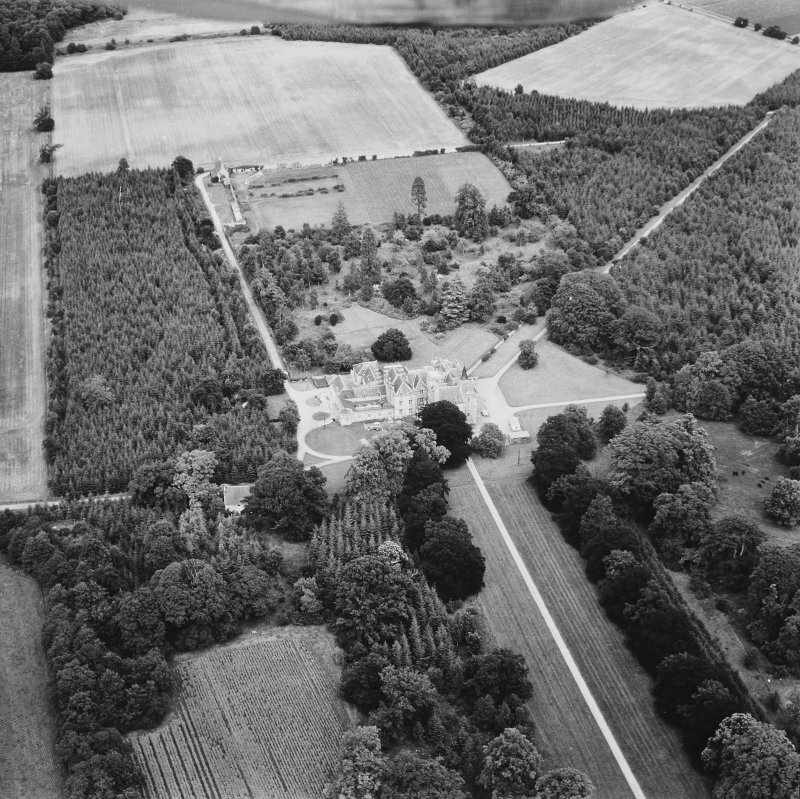 Oblique aerial view centred on the country house, taken from the NNW. 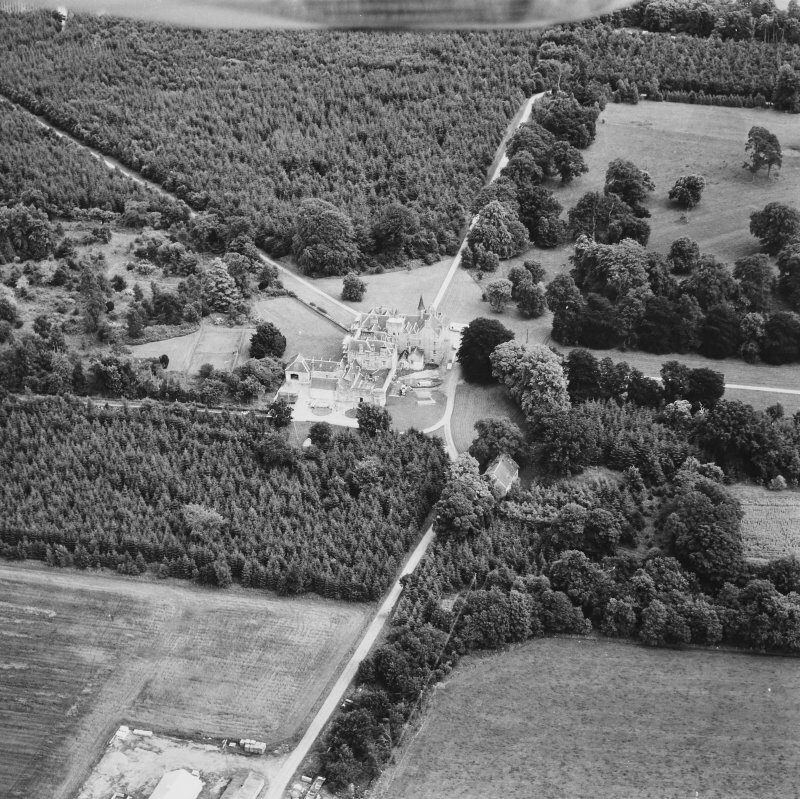 Oblique aerial view centred on the castle, country house and walled garden with the lodge adjacent, taken from the NE. 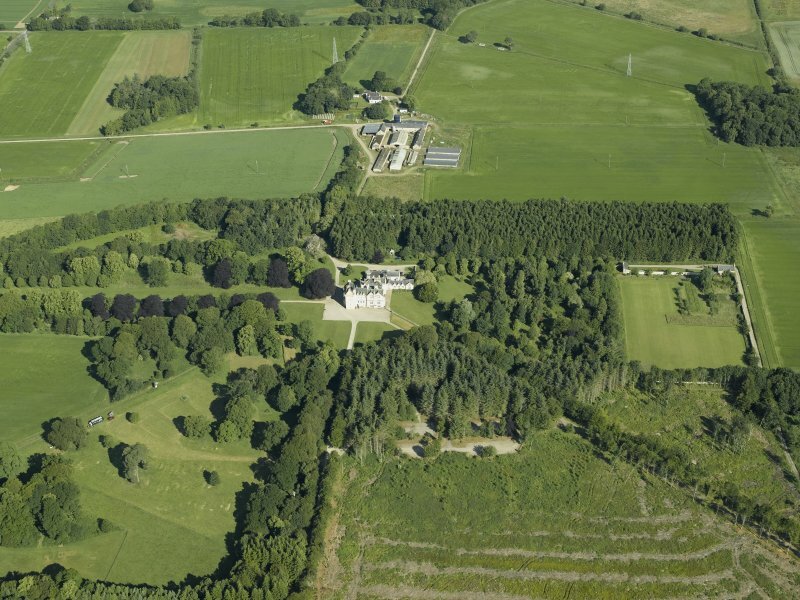 Oblique aerial view centred on the castle, country house and walled garden with the sawmill adjacent, taken from the ESE. For Rodney's Stone (Pictish cross-slab at NH 9842 5766, removed from NH 990 584), see NH95NE 3. 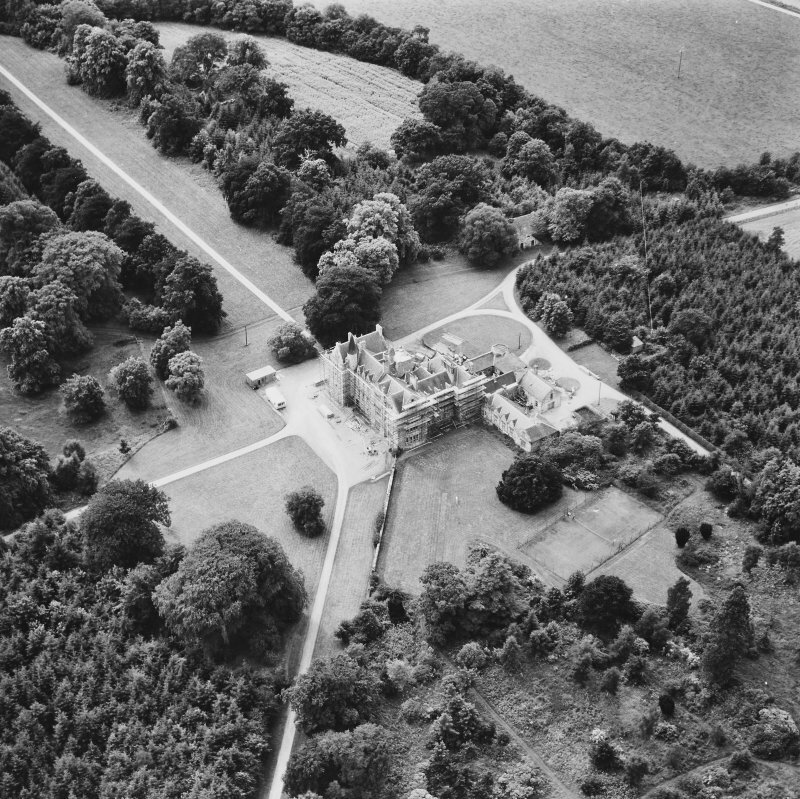 Brodie Castle: A large mansion originally on the Z-plan, was burnt by Lord Lewis Gordon in 1645 and restored thereafter, some of the older parts being preserved. The property has belonged to the family of Brodie of Brodie since 14th C. The dovecot was destroyed during the 1645 raid. 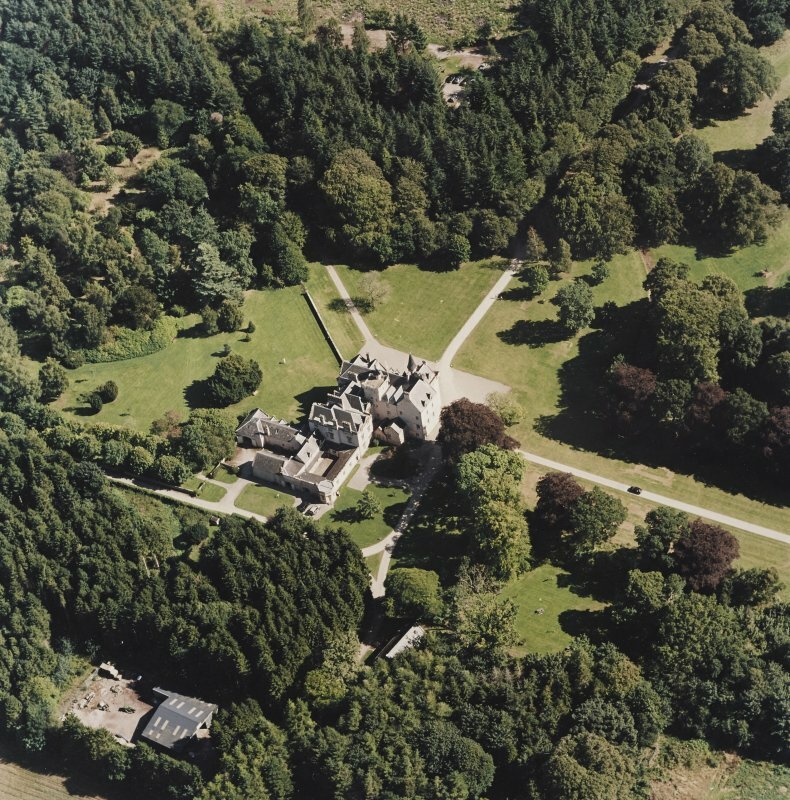 The oldest part of Brodie Castle is the tower dating from about 1430. Another part dates from about 1530 and the newest parts were added between 1820 and 1830. 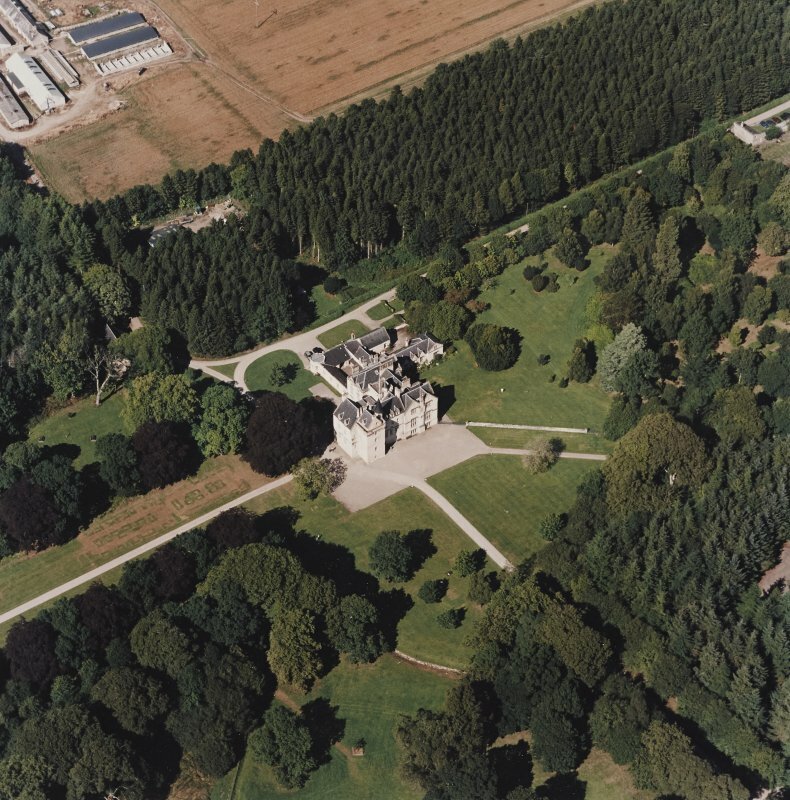 Brodie Castle, a large occupied mansion, still incorporates much of the fabric of the earlier works. The Z-plan building forms the S half of the present house. The S tower is thought by the present owner to be the original keep of 1430. In the re-entrant angle of the N tower, now inside the house, is a doorway with a lintel dated 1602. On a 1770 map of the Brodie estates by George Brown, a field centred at NH 9776 5771, is named 'Dovecot Park', but the name is no longer in use and the site of the dovecot is not known. NH 979 578. 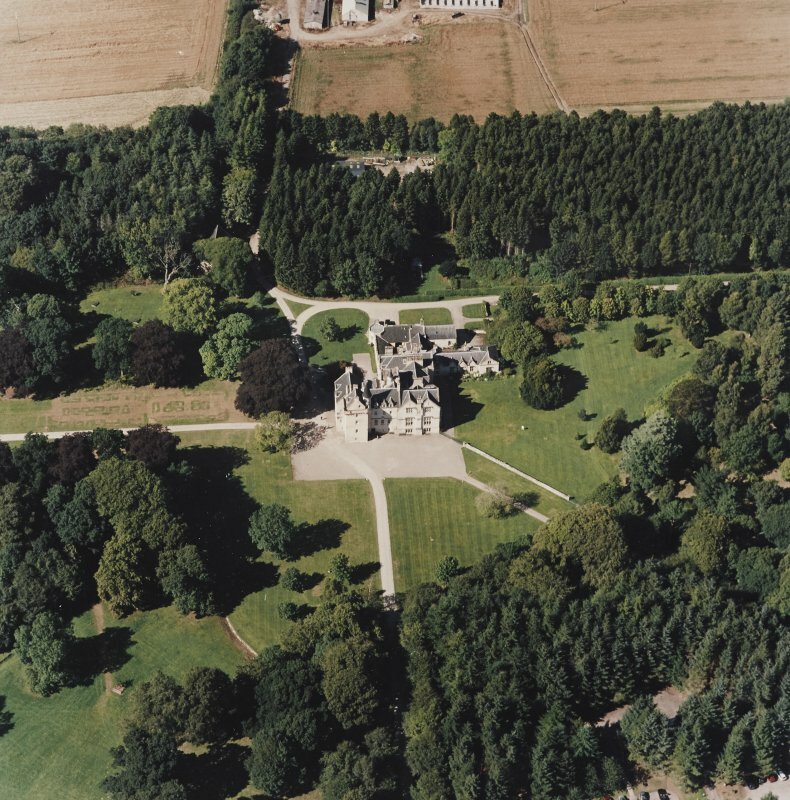 Excavations were undertaken in February 1995 in advance of renovation work on the mid 18th century stable building in the grounds of Brodie Castle, a Z-plan tower-house dating to the middle of the 16th century. No dating material attributable to the primary use of the buildings was recovered in the seven trenches opened. In c1846, the eastern half of the stables housed a smithy and store, whilst the western half remained as stables. The date of the renovations is not clear, however date stones on the relevant areas of the tower-house, a dated architect's watercolour, and a date-stone recovered from the blocking material of the SW central arch during the 1995 excavatins, all date to 1846. The architect's illustration indicates that it was the owner's intention to oversee the construction of an elaborate tower ('The Pigeon Tower') on the SE angle of the castle. This tower was never built. By the latter half of the 19th century the stable block was in a poor state of repair, having suffered serious structural deterioration a a result of the abortive tower building attempt. Thereafter, the building saw use only as a storage area. Sponsor: National Trust for Scotland. G Ewart, J Triscott and A Dunn 1995. Visible on vertical air photograph (OS 65/035/061, flown 1965). NH 979 578. Internal and external elevations of the courtyard to the N of the Z-plan tower house were made by Kirkdale Archaeology during March 1996, prior to the harling of the stonework. All features were recorded by photogrammetry and scale drawing. It was apparent that the ideals of the original and eventual architects differed, in that the former, William Burn, intended for the stonework to be covered by harling, whereas the latter, James Wylson, used well-dressed stone, indicating his desire that the stonework remain exposed. A letter from James Wylson to William, 22nd Brodie of Brodie, dated 9th February 1846, further indicates his preference for well-dressed, exposed stonework. NH 979 578. 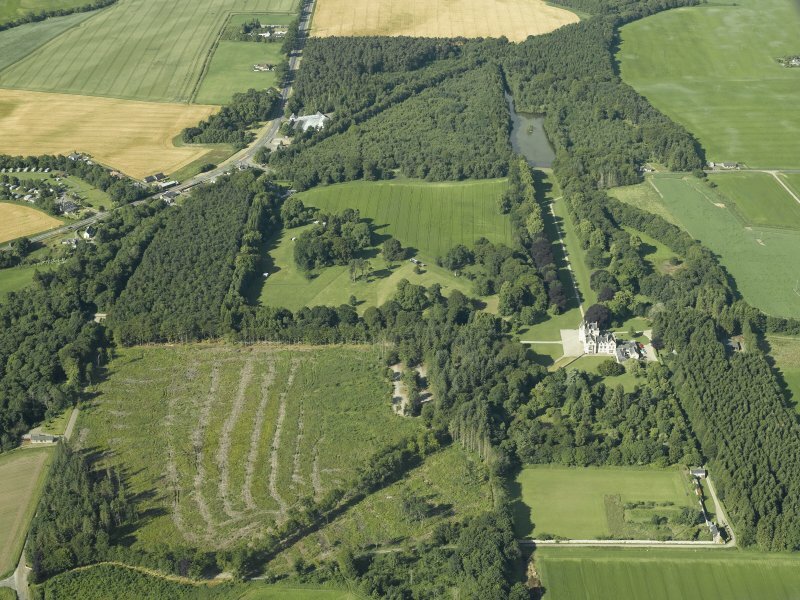 A topographic survey was carried out within the grounds of Brodie Castle to identify the location and survival of features associated with the development of the designed landscape. 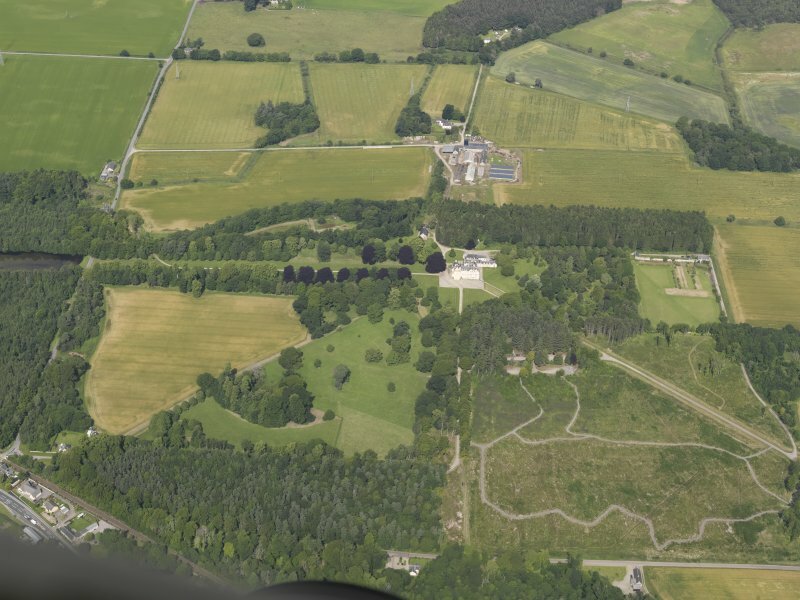 As well as buildings, boundaries, paths and drives, water courses and ponds, and other such features, the survey also recorded the locations of all large trees and tree stumps within the area. 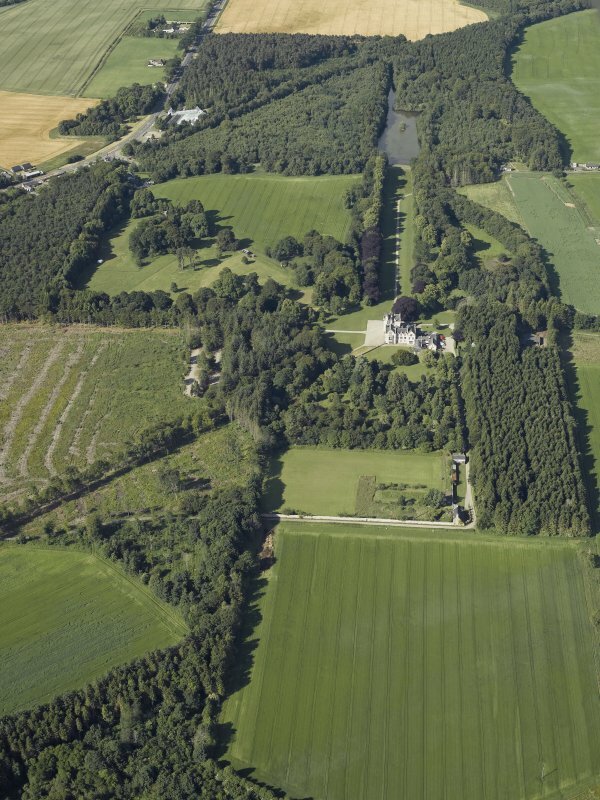 This work comprised an element of a historic landscape survey of Brodie Castle policies and was carried out in association with Landscape Conservation Studio Ltd and Scottish Woodlands Ltd.
NH 9799 5778. An archaeological recording exercise was undertaken during the removal of harling from all walls of the 16th-century NE tower, and from the N walls of the 17th-century W wing and the 18th-century stair wing. The NE tower forms a component of the current Z-plan castle. 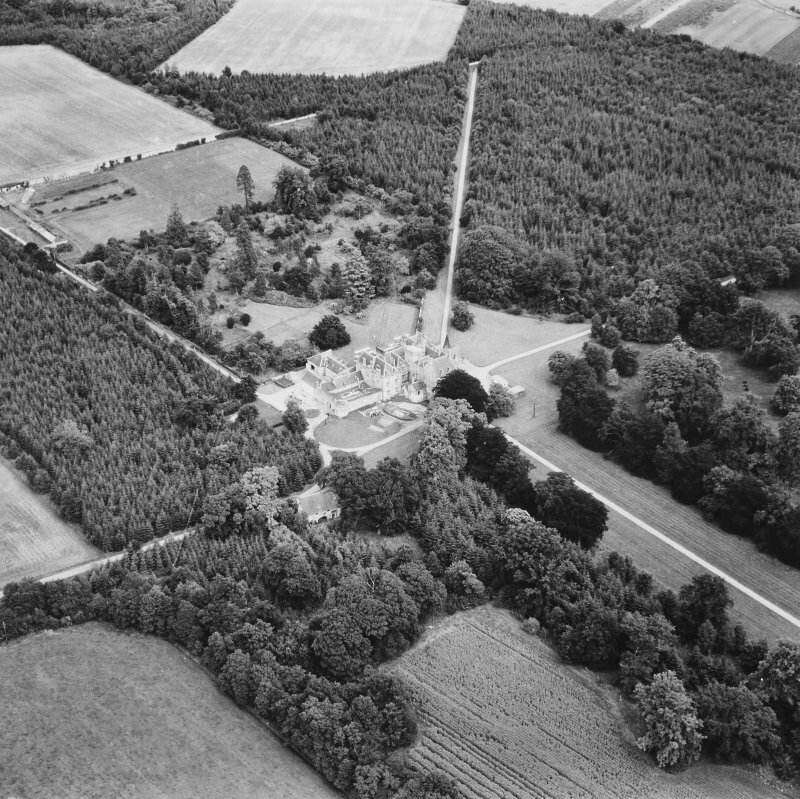 Earlier sources suggest that the NE tower may initially have stood in isolation, a hypothesis which was tested by the recording exercise. A number of episodes of building and repair were recorded, indicating that the NE tower may originally have formed a part of an L-plan castle, the form of which has subsequently undergone various alterations, most notably the reworking of the wall-heads along both the tower and the W wing, probably during the earlier 18th century. As the stonework of the E wall of the NE tower continues along the line of the E wall of the adjoining hall without any clear change in build, it is likely that the two structures are contemporary. 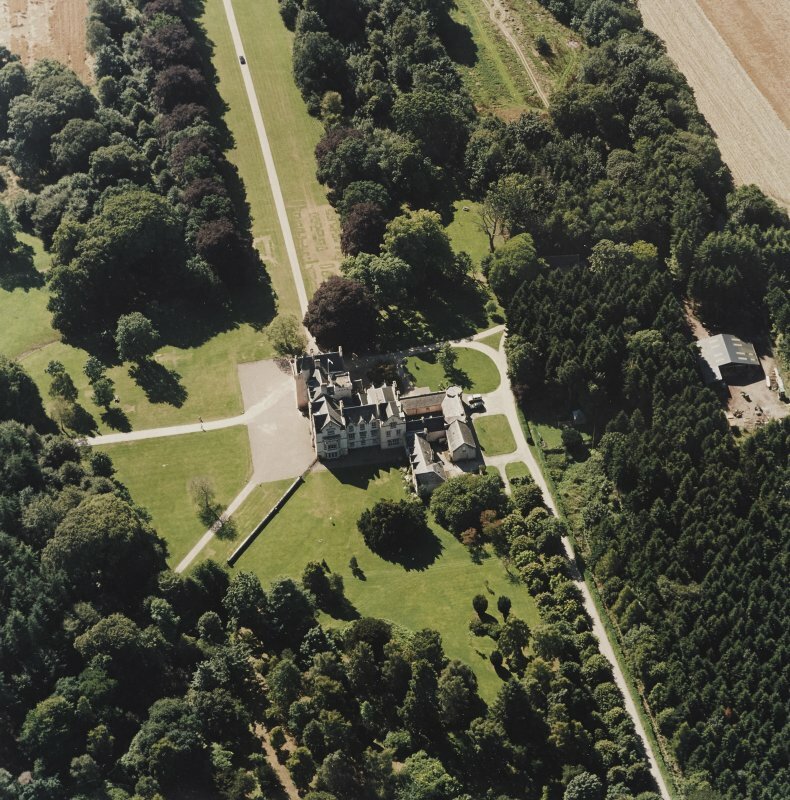 The implication is that an L-plan castle was modified in the mid-16th century by the addition of the SW tower to form the Z-plan central to the castle complex of today. Changes in fenestration and access reflected the addition of adjoining wings in the earlier 19th century, as well as changes in the internal arrangements of the buildings. NH 979 577 A 1 x 10m evaluation trench was excavated in May 2000. This ran perpendicularly out from the foot of the W wall of the SW tower (NMRS NH95NE 10). A single overall level of dark brown humic silt, probably partly garden soil, was uniformly some 0.5m thick for the length of the trench, overlying natural. This level was excavated to natural at the tower wall foot for 1.5m. It was found to consist of four sub-levels each containing identical artefactual material. This comprises a considerable quantity of window glass, including two near-complete rectangular quarries, fragments of free-blown 'black' glass bottles, probably 18th century, clear glass wine glasses, one possibly with part of an air-twist stem. A large amount of tin-glazed pottery represents four or five vessels including a strainer, a small hand-painted blue and white cup, and parts of a polychrome hand-painted vessel. These tin-glazed wares probably date from c 1700-40. Subsequent activity included a stone-lined drain, perhaps of the 18th century; and a rumbling drain containing graded gravel and cobbles with larger cobbles at the base, some 1.2m below the surface, probably 19th or earlier 20th century. The foundation of the tower was exposed and revealed to simply consist of a single course of substantial stones up to 0.5m in diameter or more, set directly onto the natural and protruding up to about 15cm proud of the wall face above. Remains of clay bonding were seen. 'There are three diptych sundials on angles of the house' (MS 5741/9/38). 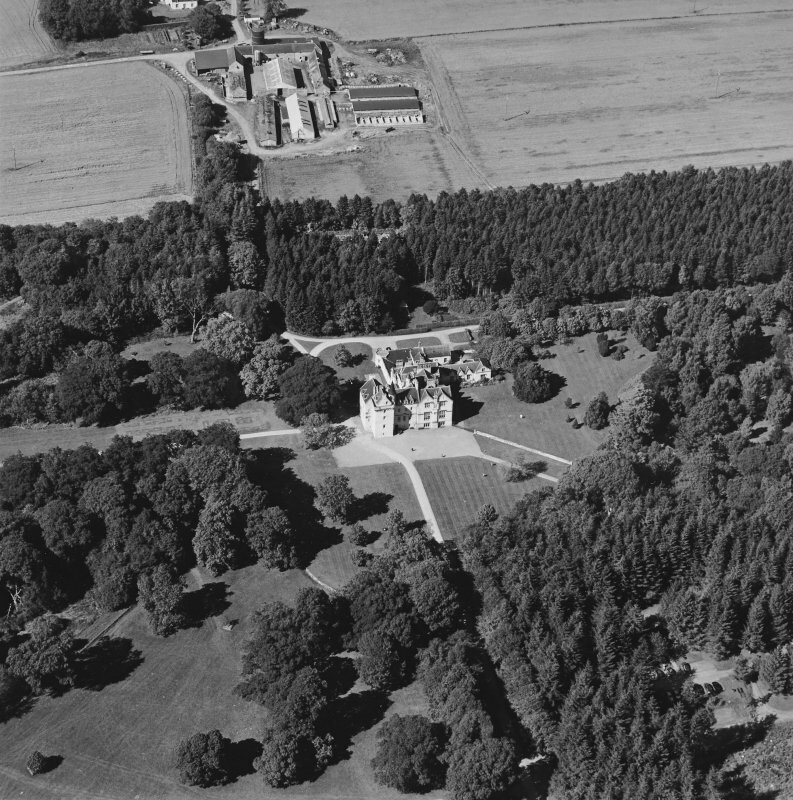 Photographic survey of Brodie Castle, Morayshire, by the Scottish National Buildings Record/Ministry of Work in August 1964. 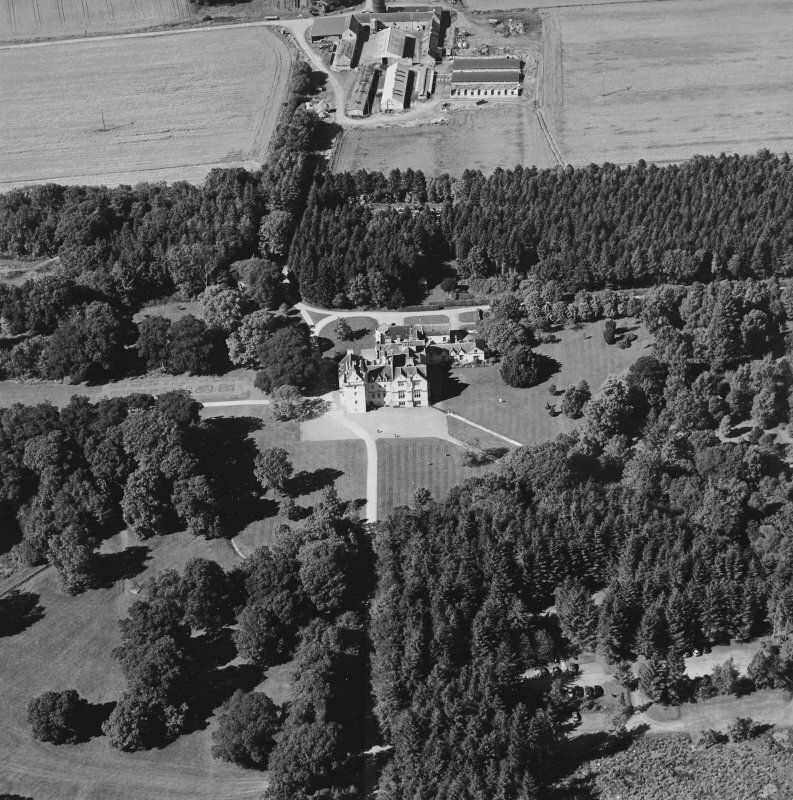 There have been Brodies at Brodie for over 800 years; 25 lairds in all, although the present building dates only from 1567, the time of the 12th laird, Alexander. The first structure was a standard Z-plan tower-house, a rectangular block with square projecting towers at two opposite corners. The south-western tower and the main block occupy the western half of the south front. Early in the next century a west wing was added, lying to the north of the south-west tower and hard against the main block. In the 19th century a two bayed east wing was built, immediately to the east of the original tower. The 16th century tower-house was a compromise between comfort and modest security. The latter can be seen in the vaulted guard-chamber at the base of the south-western tower with its gun-loops and slit windows. The principal apartments, where comfort could be had, would have been on the first floor. The high hall, which occupied the whole of the main block, is now the Red Drawing Room, a ponderous conversion by William Bum in the 1820s, while the laird's private chamber, which was in the adjacent south-western tower, is now the remarkable Blue Sitting Room. The original vault survives here, covered in rather crude plasterwork of the 1630s. The addition of the west wing in the early 17th century provided on its first floor a large room for the laird's use adjacent to the old laird's room. This room is now the Dining Room. The visitor may not immediately appreciate that the dusky brown maidens and vines that spill from the blue background of the ceiling are made of plaster; the graining was applied by the factor in the 1820s who felt that he was creating a room that would be 'perfectly unique'. It is diffIcult both to interpret and to date the plasterwork. The four groups of emblematic maidens in the corners may represent the elements earth, air, fIre and water. There are a few late 17th century parallels, however, which would place it in the lairdship of either of two intensely Presbyterian lairds. The 19th laird, Alexander (1697-1754), is altogether the more lively and likely candidate. 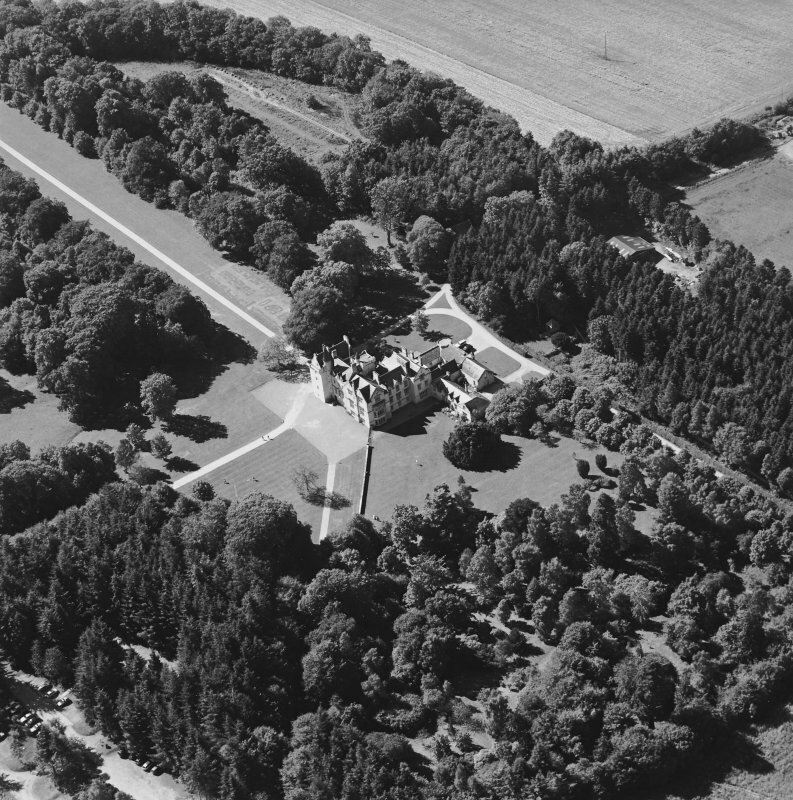 His wife, Mary Sleigh, was responsible for a major remodelling of the grounds with radiating avenues, a short canal and pond and a wilderness. Like many early improvers, she and her husband ran into financial diffIculties; however, the essential elements of their work still survive in the west end of the present avenue and the pond. 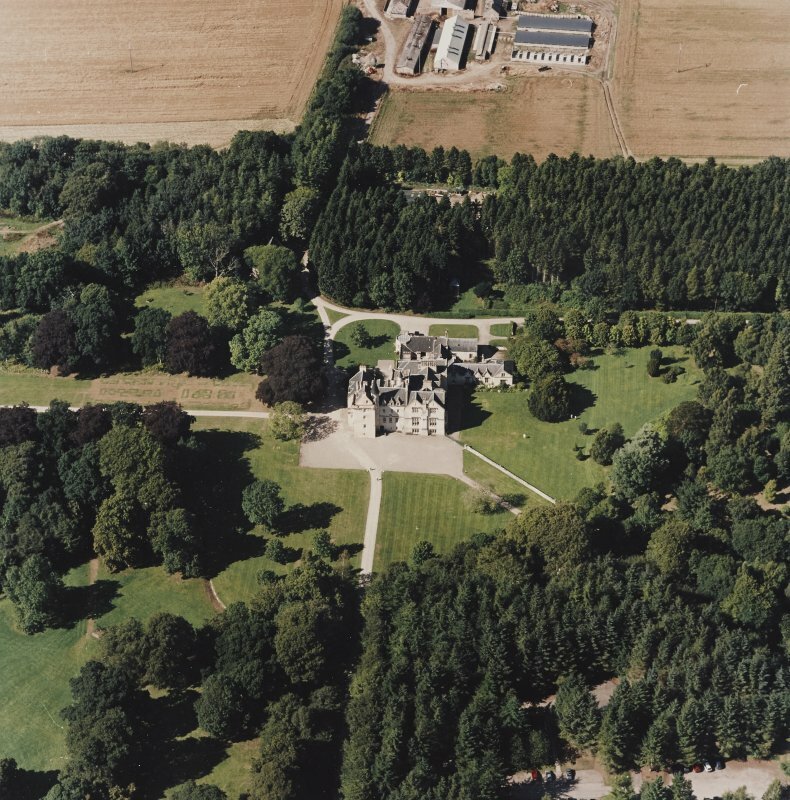 The last phase of building at Brodie began in 1824 when William Brodie, the 22nd laird, commissioned an elaborate scheme from William Bum of which only the east wing was built. In 1846 the York architect James Wylson carried out various modifIcations, including the remodelling of the entrance hall with squat 'Romanesque revival' columns and the fItting out of the pleasing library. The paintings at Brodie represent a particularly wide collection and include a large number of 20th century artists collected by the 24th laird. A fine Pictish stone, Rodney's Stone, stands beside the entrance drive. ound at the church of Dyke, it has a cross on one side and two fish monsters, a Pictish beast and a double disc and Z-rod on the other, all carved in relief It also bears three ogam inscriptions, one of which (to the right of the cross) transliterates EDDARRNON; the name Ethernan is recorded in the Annals of Ulster referring to a Pict who died in AD 669. 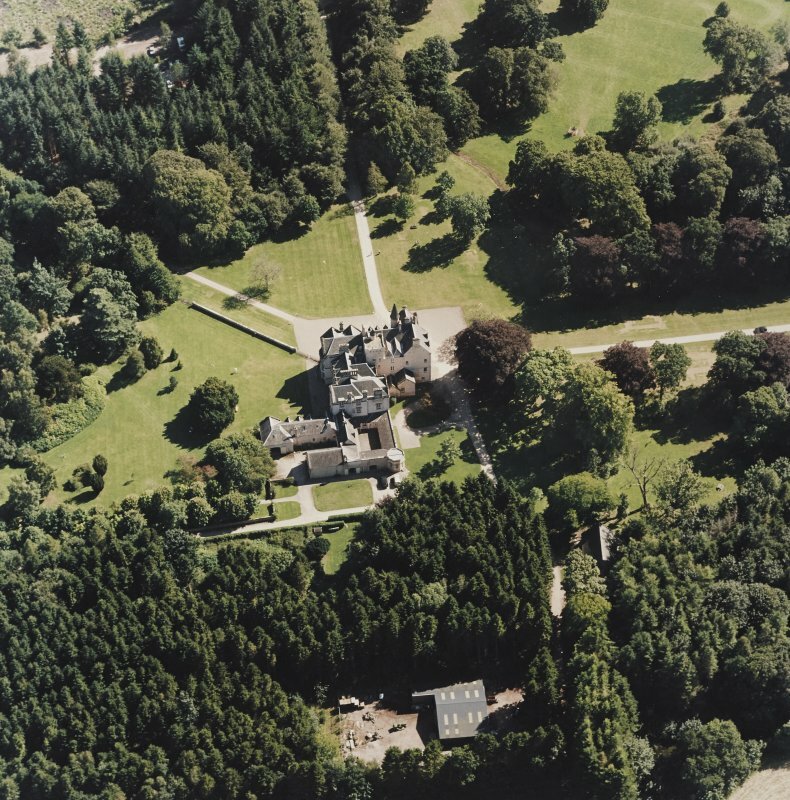 There have been Brodies at Brodie for over 800 years; 25 lairds in all, although the present building dates only from 1567, the time of the 12th Laird, Alexander. The first structure was a standard Z-plan tower-house, a rectangular block with square projecting towers at two opposite corners.The south-western tower and the main block occupy the western half of the south front. Early in the next century a west wing was added, lying to the north of the south-west tower and hard against the main block. In the 19th century a two-bayed east wing was built, immediately to the east of the original tower. The 16th-century tower-house was a compromise between comfort and modest security. The latter can be seen in the vaulted guard-chamber at the base of the south-western tower with its gun-loops and slit windows. The principal apartments, where comfort could be had, would have been in the first floor. The high hall, which occupied the whole of the main block, is now the Red Drawing Room, a ponderous conversion by William Burn in the 1820s, while the laird's private chamber, which was in the adjacent south-western tower, is now the remarkable Blue Sitting Room. The original vault survives here, covered in rather crude plasterwork of the 1630s. The addition of the west wing in the early 17th century provided on its first floor a large room for the laird's use adjacent to the old laird's room. This room is now the Dining Room. The visitor may not immediately appreciate that the dusky brown maidens and vines that spill from the blue background of the ceiling are made of plaster; the graining was applied by the factor in the 1820s who felt that he was creating a room that would be 'perfectly unique'. It is difficult both to interpret and to date the lasterwork. The four groups of emblematic maidens in the corners may represent the elements earth, air, fire and water. There are a few late 17th-century parallels, however, which would place it in the lairdship of either of two intensely Presbyterian lairds. The 19th laird, Alexander (1697-1754), is altogether the more lively and likely candidate. 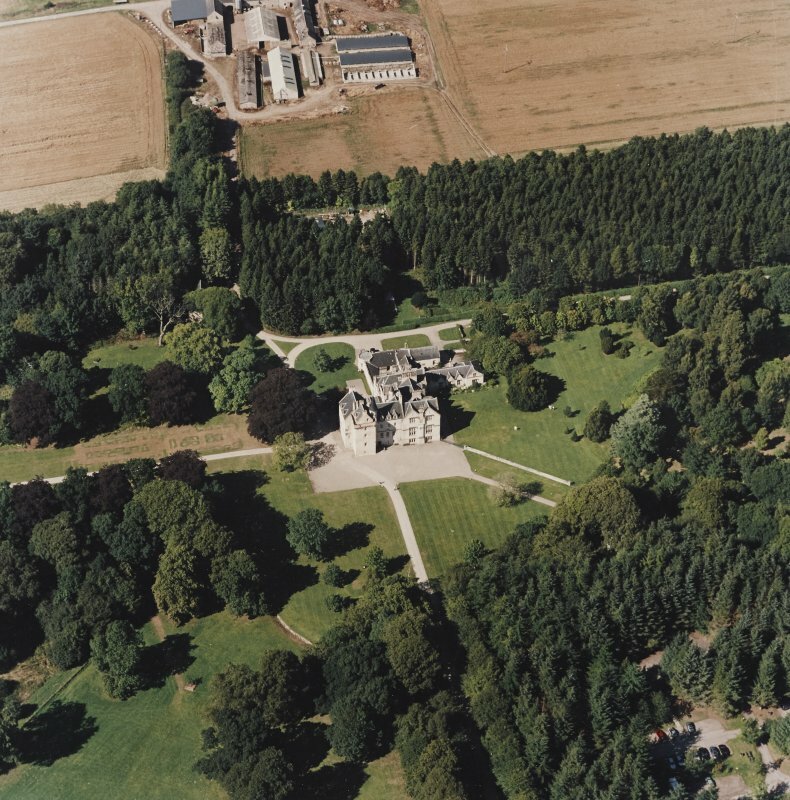 The last phase of building at Brodie began in 1824 when William Brodie, the 22nd laird, commissioned an elaborate scheme from William Burn of which only the east wing was built. In 1846 the York architect James Wylson carried out various modifications, including the remodelling of the entrance hall with squat 'Romanesque revival' columns and the fitting out of the pleasing library. The paintings at Brodie represent a particularly wide collection and include a large number of 20th-century artists collected by the 24th laird. A fine Pictish stone, Rodney's Stone, stands beside the entrance drive. Found at the church of Dyke, it has a cross on one side and two fish monsters, a Pictish beast and a double disc and Z-rod on the other, all carved in relief. It also bears three ogham inscriptions, one of which (to the right of the cross) transliterates EDDARRNON; the name Ethernan is recorded in the Annals of Ulster referring to a Pict who died in AD 669. 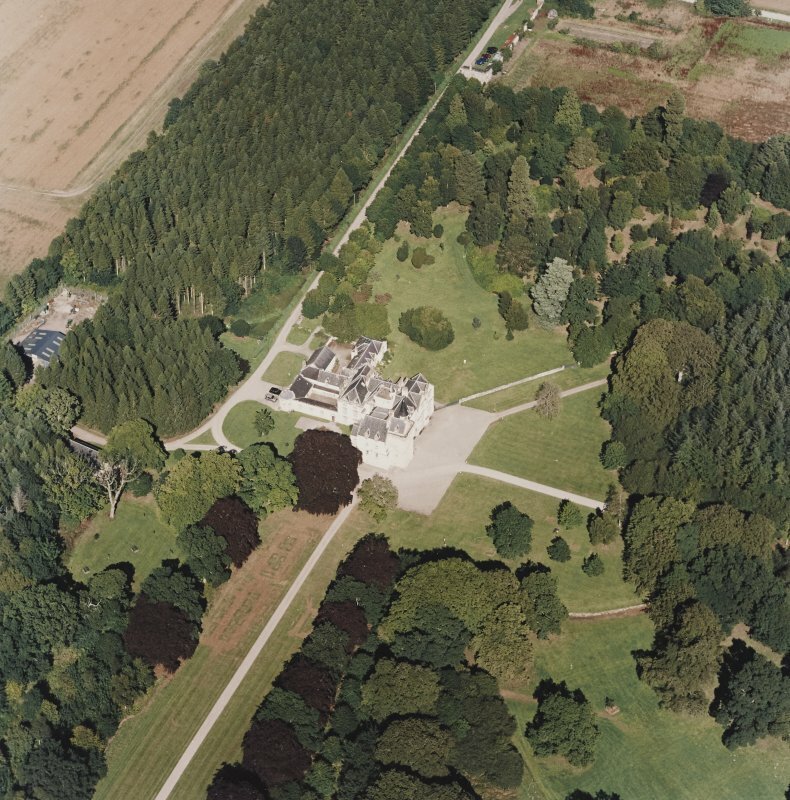 NH 97959 57775 An evaluation was undertaken on 17 January 2012 on a proposed play area N of the 19th-century extension to the castle. 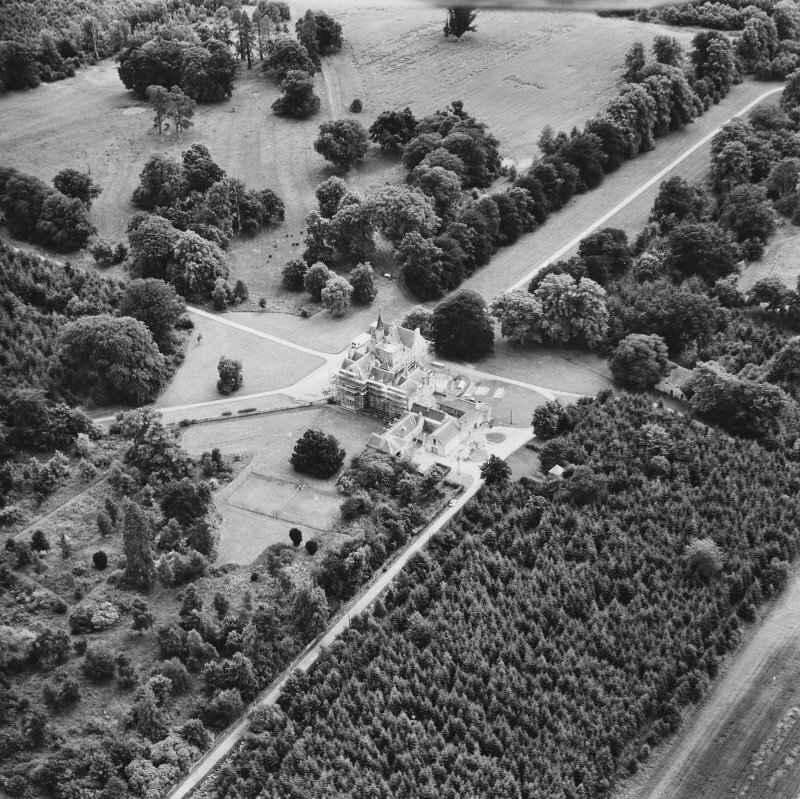 Much of the area appeared to have been woodland from the 18th century, but a trench was identified as the line of the N boundary of the 18th-century formal N gardens, which had been removed in the early 19th century. NH 97959 57775 A geophysical survey was carried out, 6 August – 19 September 2013, as part of a project to gain a better understanding of the potential survival of historic garden features and potential structural remains to help inform management plans. 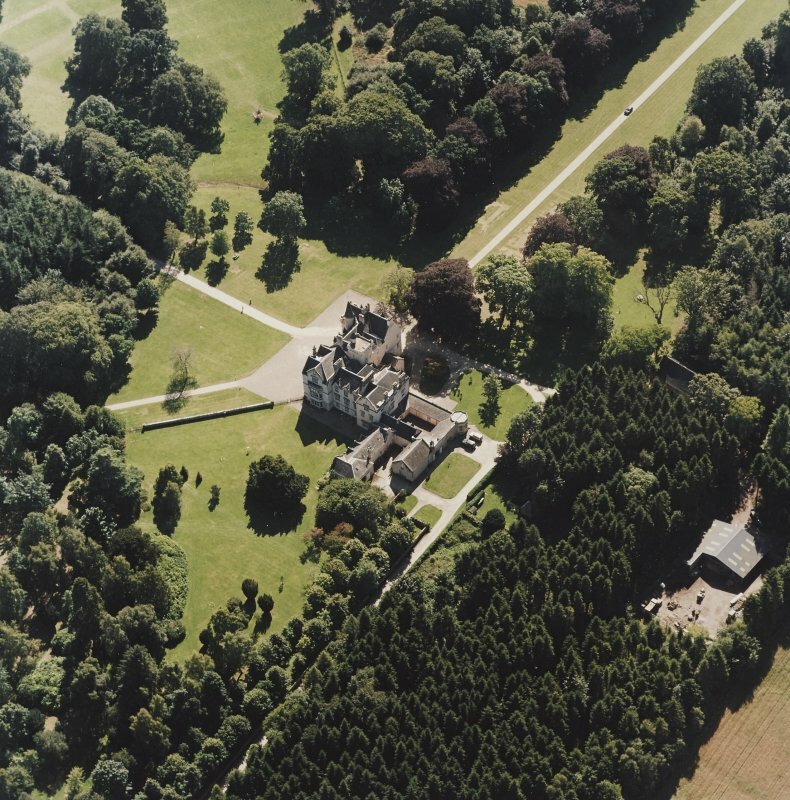 The survey at Brodie Castle aimed to gain a better understanding of the pre-18th-century landscape, including the gardens, walled courts, ancillary buildings etc, which may have surrounded the castle. The survey covered areas of lawn, tarmac and gravel. Resistance survey was undertaken over the lawn areas and GPR over the tarmac and gravel areas. The survey identified numerous anomalies of potential interest. The resistance data suggests structural and other remains associated with the original formal SW approach to the castle. 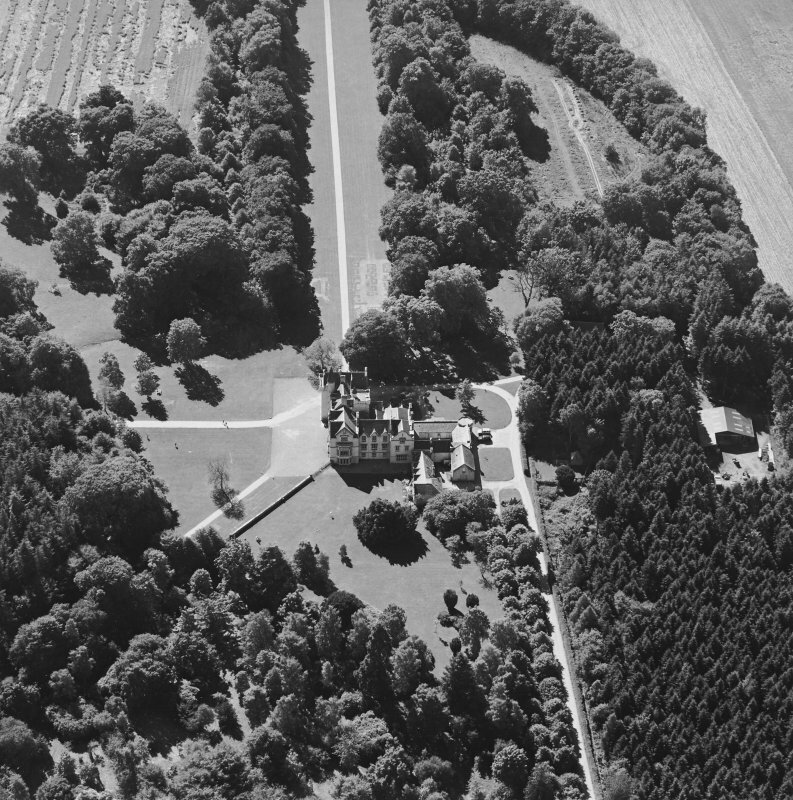 Suggestions of robbed out foundations have been detected to the NW of the castle near the extant stable block. 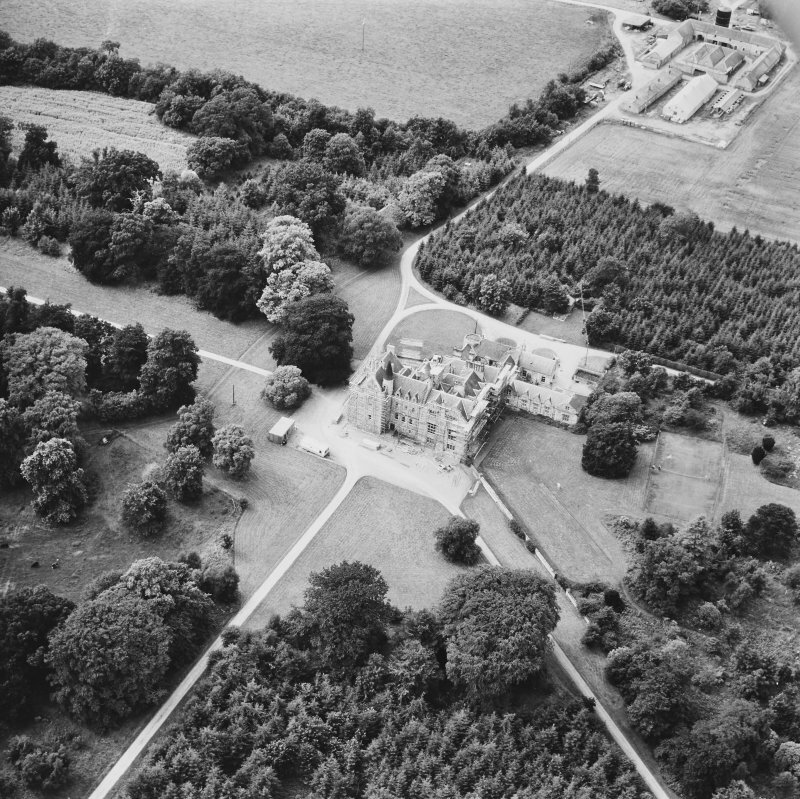 More ephemeral anomalies to the SE of the castle suggest the possible limits of a former formal garden. Further anomalies have been recorded to the NW of the castle and are indicative of relic garden features. The GPR data are dominated by responses from buried services, primarily to the SW and SE of the castle. 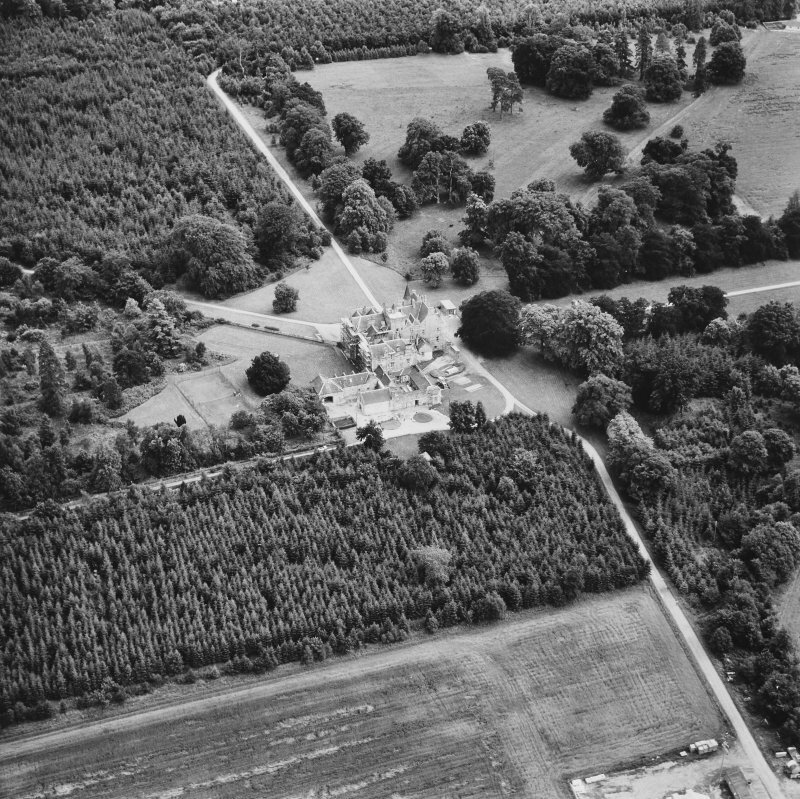 Other anomalies thought to relate to earlier layouts of the castle grounds may also have been detected. 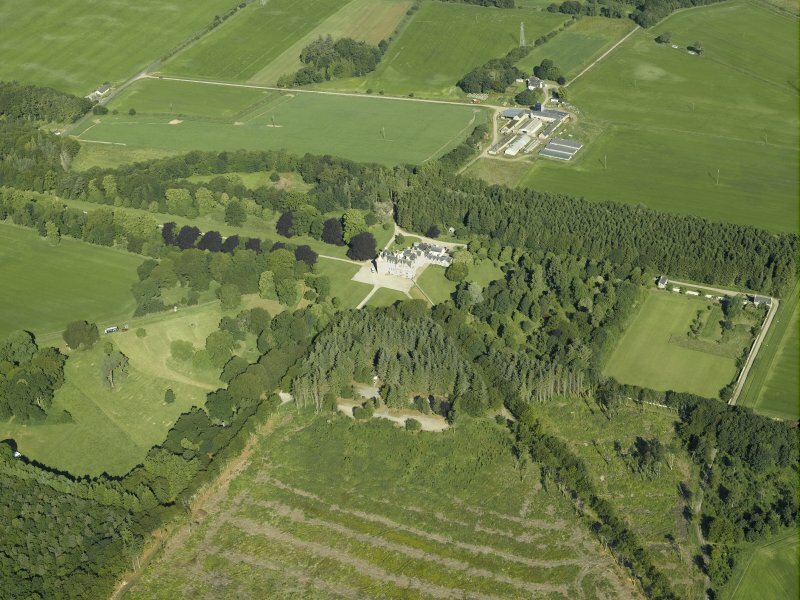 A further resistance survey was undertaken within the Dovecote Park of Brodie Castle. This survey formed part of a wider evaluation of the area prior to potential development. A varied level of resistance was recorded across the area. This is believed to primarily be due to variations in recent ground cover and vegetation. Several trends are apparent in the data and reflect ploughing. 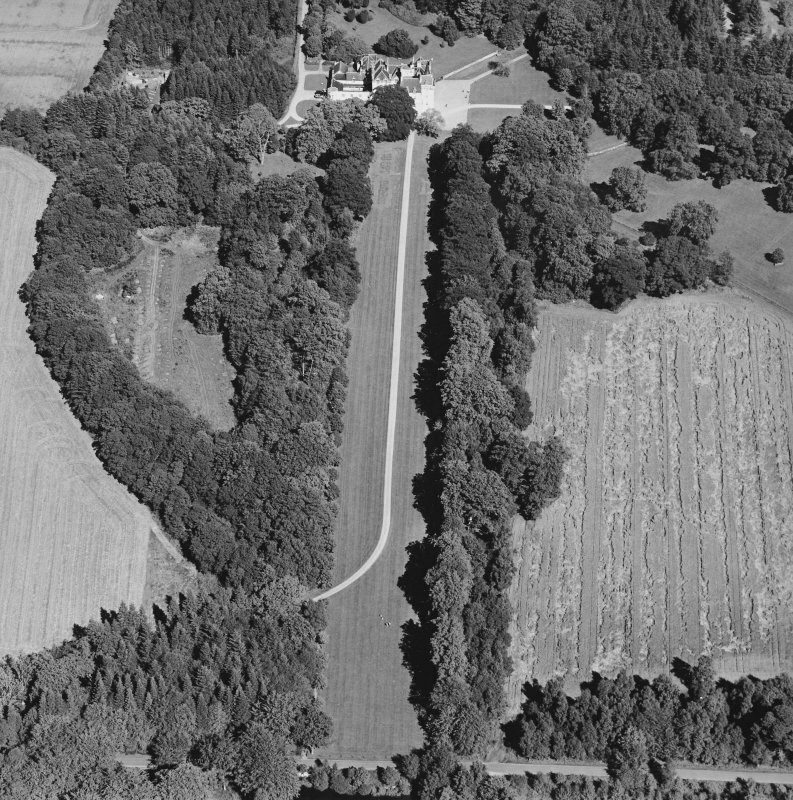 Although several discrete anomalies of potential archaeological interest have been noted, interpretation is cautious given the varied use of this area in modern times. fenestration, canted windows, shaped and crowstepped gables. Five-bay single storey and attic wing with similar fenestration extends at right angles at northeast. Varied glazing; coped end, wallhead and ridge stacks; slate roof.